The mayors, some with SYRIZA affiliations, have opposed the checks because they argue that this will lead to employees being fired and leave basic local services, such as nursery schools, without the necessary staff. The government argues that the mayors are simply trying to protect civil servants likely to vote for SYRIZA at the next elections, having abandoned their traditional masters PASOK and New Democracy. The dispute is now heading to the courts, with the government taking the high moral ground as it argues that it is trying to introduce meritocracy and transparency in the public sector. For this argument to hold there needs to be a certain suspension of disbelief given that the two governing parties have been responsible for staffing and managing the public administration since 1974. Nevertheless, even if we are to take the government’s argument at face value, there is one niggling issue that needs to be addressed. In order to understand why these contracts have to be reviewed, we must also appreciate the circumstances in which they were awarded. In 2004, the then New Democracy government led by Kostas Karamanlis issued a presidential decree that allowed fixed-term contract workers in the public sector to become permanent employees. The criteria included that the applicants had to have worked for a minimum of 18 months, during which their contract must have been renewed. More than 75,000 employees applied and a total of 35,239 were accepted. New Democracy chose this option because it feared telling thousands of workers only a few months after it came to power that they would no longer have jobs. Karamanlis’s government was not the first or last to be concerned about taking such decisions. But it should also be clear that this was not a case of firing people but simply not rehiring them. Also, in the interest of adding some perspective, it should be noted that New Democracy had won the March 2004 elections by almost 5 percentage points, garnering some 360,000 votes more than PASOK and gaining a comfortable parliamentary majority. New Democracy had plenty of scope to choose another path but instead it opted for the tried and tested option of using civil service jobs to curry favour with voters. The consequence of this decades-long practice are now well known but it is worth taking a moment to remember that spending on public sector wages increased from 21.3 billion euros in 2004 to 30.7 billion in 2009, when the Karmanlis government lost the elections. During this time, primary public expenditure went up from 75.3 billion euros to 116.2 billion. 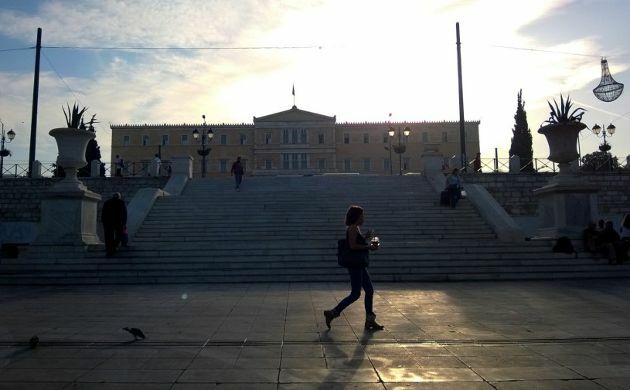 Now, the New Democracy and PASOK coalition is examining the whole process as they suspect many of those awarded permanent deals following the presidential decree did not deserve them because they used fake degrees or qualifications. Administrative Reform Minister Kyriakos Mitsotakis says this is a sign of the government’s commitment to reform. But what has been the fate of the man responsible for the legislation that allowed these 35,000 employees to be hired when it was not necessary, the man on whose watch – according to the current government’s argument – rules were broken and thousands gained taxpayer-funded jobs by lying? Surely, this man must also be held accountable, maybe even lining up in court alongside the mayors who have inherited this problem. Step forward Prokopis Pavlopoulos, former Interior Minister and current New Democracy MP. Pavlopoulos has spent the last few years publicly justifying his actions in government. He is one of several staunch defenders of Karamanlis’s handling of the economy. He is at the forefront of those who have argued that Greece was driven into a troika programme by a bungling George Papandreou and not because its public finances went off the rails. Pavlopoulos has not been held accountable for his actions, despite Mitsotakis’s arguments that this government is introducing greater accountability and transparency. Instead, the former minister has remained a stalwart of his party. So much so, in fact, that when Prime Minister Antonis Samaras announced this week the formation of a party committee to prepare for a review of the Greek Constitution, he chose Pavlopoulos to head the panel. So, let’s get this straight: The government is checking the contracts of thousands of public sector employees because it believes in many cases they were hired illegally but the person who decided and oversaw the awarding of these jobs has been tasked with deciding what changes need to be made to the constitution. You can call this reform if you like but hypocrisy might be a more appropriate word. It is interesting to see, that Mr. Malkoutzis after having used for years a very poetic language, now has found very clear words that hopefully will help Greece to overcome the current crisis.